One week after being named to the Mid-State All-Conference team, Boone Central senior Bobbi Beckwith has had numerous regional and state honors roll in for her performance during the 2010-11 basketball season. Beckwith was one of five Central Nebraska standouts selected for the Grand Island Independent All-Heartland Super Squad, received Class C1 All-State second team honors from the Omaha World-Herald and received All-State honorable mention in the Lincoln Journal-Star. She is among a number of Albion News area stars selected for various postseason awards in recent weeks. How does Boone Central Coach Mike Kennedy summarize the career of Bobbi Beckwith? Beckwith finished with 906 points in her career with the Cardinals, but she’s another guard who can impact a game by doing more than scoring. During her senior year, Beckwith averaged 12.1 points and 4.4 rebounds per game. 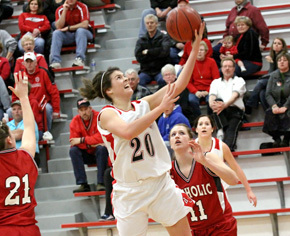 She led the Cardinals with a 67 percent rate at the free throw line and added 87 assists and 59 steals. It is on the defensive end where Kennedy feels that Beckwith, a repeat Super Squad selection, made her biggest improvements. Beckwith currently plans to continue her career at Iowa Western Community College. Boone Central juniors Jenna Lehmann and Jaime Kennedy received C1 Honorable Mention in the OWH. Lehmann had previously been named Mid-State All-Conference and Kennedy received Mid-State Honorable Mention. Beckwith and Kennedy received all-state honorable mention from the Lincoln Journal-Star. Kennedy was selected for the All-Heartland fourth team and Lehmann was honorable mention in the G.I. Independent. Complete List of Award Winners in Print & Online Editions of Albion News.